Answering Service | Telephone Answering Service | 1-888-GO-ANSWER! Day or night, rain or shine. Our live agents are available all the time. While you’re asleep, our team is awake. Never miss out on an opportunity to secure a sale with over-the-phone order entries. Managing appointments can be a hassle. Which is why we made it hassle-free. We know the ins and outs of handling sensitive medical information. We have a dedicated division of legal experts who are trained to efficiently and brilliantly handle all aspects of legal intake. Get alerted anywhere, anytime. Straight to your pocket. All the data and information you’ll ever need - on your desktop, or with AlwaysOn - our iPhone & Android app. We have real humans. With a real live voice. Goodbye robots. 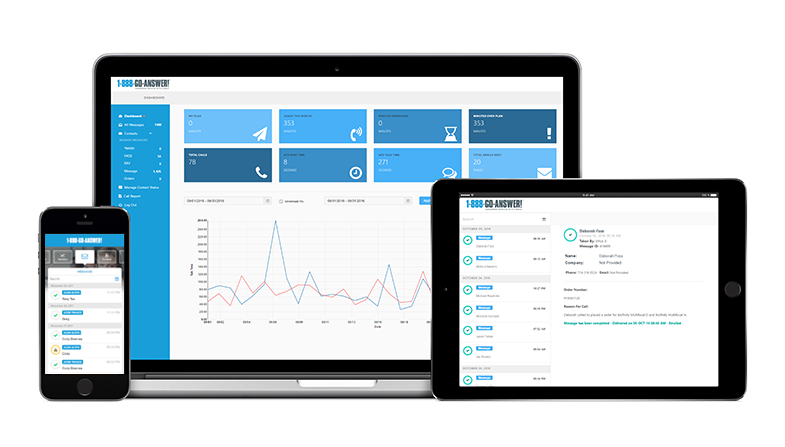 The dashboard shows an overview of all your call data including both real time and connected calls.